In the drop-down list, add the used lanes in a group next to the field showing the name of the current lane. Depending on the position of the MIDI Editor, this will be above or below the full list of lanes. Then any of the used lanes can be clicked without any searching (for dots) or scrolling. The used lanes still appear in the full list, as can be seen. It's 'only' a matter of adding them again to the drop-down. Last edited by DarkStar; 09-27-2015 at 10:29 AM. I can't believe we didn't already pick this one up for a group moan! FR, anyone? (cue well worn record BPP has allowed you to decide what CC etc shows and what doesn't from version 1. +1, it's a pain to go hunting around for your CCs in a big list. Is it ok to say that my other DAW shows all currently used CC's on the horizontal divider between the editor and the CC lane for immediate access? Makes perfect sense to me... for that one thing. Pretty efficient use of space. Post der Screenshot Lawrence. Ve need to know. I think DarkStar's suggestion is a much better solution than how Ableton handles it. Just my 2 eurocents. 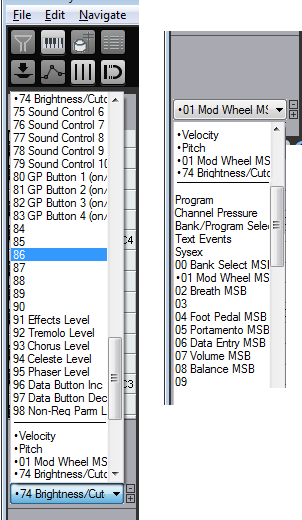 ... also, group the used CCs in the MIDI Editor Filter Events window too. I agree, because adding a controller would not involve switching modes (unlike Live's method). One more thing which could perhaps be improved: we don't really need the dots in the short list of used parameters, now do we? I'd rather see two more characters of the parameter name. I thought everyone here would know what it looked like by now but here it is. Most logical one I've used to date. A very useful way. Let's adapt this to Reaper. Here's one way. The button to the left of the Velocity button could hold Darkstar's proposed menu. It could add new CC lanes to the quick-access-button-header menu as seen in Lawrence's shot. ALT-click on the CC lane heading button (like Velocity in the shot) to clear the CC lane. CTRL+ALT+click on the CC lane heading button to clear and remove from button-heading list. Right-click on CC lane heading button to select another CC lane from a list containing all but the already active and showing CC lanes from a Darkstar-like menu. CC lanes that contain data(i.e. are active) but not being displayed at the moment are at the top of the ilst. ... I was thinking of the simplest implementation, in order to get something done. More extensive suggestions have been made in the past. Last edited by DarkStar; 11-03-2012 at 03:40 PM. Yeah, I wasn't suggesting Reaper should copy that. Only that there are potentially more ways to display data than in a list. My earlier "+1" was more to the logical idea of at least putting used parameters up top in the list. I think Cubendo does it that way. The other thing was just an reminder that lists actually aren't the only thing. Sometimes drop down lists are the best choice, other times maybe not. the scrollable pop-up menu is painful to use. Looking for small dots to the left of the CC names (and when are we going to be able to change them too?) is a pain. Re: the horizontal list: it will be OK for up to several CCs, but will need some sort of horizontal scrolling when the name list exceeds the MIDI Editor panel width. Just found this thread when searching for something similar. Well, until this idea gets implemented, is there any way to remove all the CC's I don't use? There are lots of actions refers to CC lane. So you can simply bind these actions very quickly to shortcuts or buttons. I hope you can understand me? Without german beer my written english is always very bad, with beer it becomes unbearable!. Less is more! To much limited the own creativity.